Sidney Nolan, Head of a Gallipoli Soldier (x 4). War. What is it good for? Absolutely nothing. Talk about stating the obvious. As I listen to Edwin Starr belt out this anti-war, funk classic I get goose-bumps. And despite the irresistible urge to shake my booty, I simultaneously feel like crying; not tears of sadness, but of frustration and despair. Starr can, “Say it again, y’all” as often as he likes, but nobody seems to listen. We are a nation at war. Here I go stating the obvious again, but it’s easy to forget. We aren’t being bombed, there are no war time shortages and so far, the grand total of our casualties in Afghanistan stands at a mere 17. For most of us here in the lucky country, our comfy lives go on as normal. The war seems like something confined to the telly. So I approached Sidney Nolan’s The Gallipoli Series hoping for a bit of a wake up call, a short, sharp slap to remind me that war really is hell. Nolan’s portraits of Anzacs capture a certain stunned disbelief, as if these men can’t quite fathom what they’ve seen, and what they’ve been asked to do. Nolan’s soldiers seem shocked, but the paintings aren’t shocking. 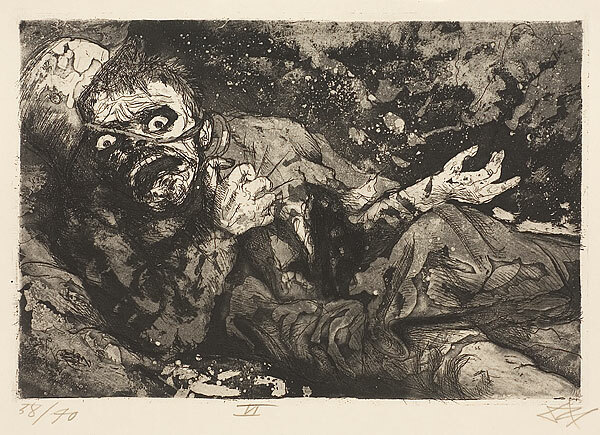 They lack the visceral punch of Otto Dix’s Der Krieg etchings, or Goya’s earlier Disasters of War. These two bodies of work reveal humanity’s dark seething core: men are monsters with ravenous rictus grins, ready and willing to kill or be killed. They aren’t just a smack in the face, they’re a knife in the heart. Otto Dix, Wounded soldier - Autumn 1916, Bapaume, plate 6 from Der Krieg. Nolan’s Gallipoli paintings aren’t in this league. They don’t even come close. His pictures are pale in comparison, but even they ask the same question as Goya and Dix’s truly brilliant works. Knowing the reality of war, how can we keeping doing it again and again? We must suffer from a kind of wilful amnesia. The same day that I visited Nolan’s paintings our current Prime Minister and the wannabe PM both took time out from their campaigns (or more accurately they worked the photo op) to attended the funeral of Nathan Bewes, the latest soldier killed in Afghanistan. Is it terrible that a young man died? Yes it is. Man Dies in War. Is this a headline? Is this news? No, just stating the obvious. War means death. What did we think was going to happen? Sidney Nolan: The Gallipoli Series, Gosford Regional Gallery, until Sept 5. ← Julie Rrap: She’s Back!